a place where the unicorns dance. at this wondrous, glorious sight. lest they run away in fright. they gathered in silent formation. and took his place without hesitation. and they turned and looked at me. as if giving a silent plea. I heard the beat of a drum. each in an opposite direction. and performed in tight synchronization. and visions of each new evolution. and the dance for those oppressed. with the fervor of beings possessed. and the dance of times yet to be. then we danced the dance of me. and time began to repeat. and new stars being created. and knew all was interrelated. at the pain of being made whole. 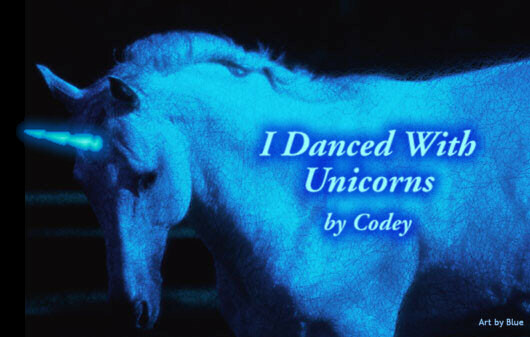 as I, with the unicorns, danced. released us from our trance. as long as the unicorns dance.